Free shipping to US 48 on orders over $50! Plenti+ Nursing Pillow + Nursing Cover - Mayberry Blooms is rated 4.7 out of 5 by 10. Ingenuity’s Plenti+™ Nursing Pillow + Nursing Cover helps you cuddle and cradle your baby while offering support during feedings. The Relax-Fit design aligns with most body shapes to offer support for both mom and baby. Crafted with the help of an IBCLC, an International Board-Certified Lactation Consultant this pillow was created to make nursing and bottle feeding comfortable. When things are hazy during those late-night snuggles or early-morning fusses, the visual tabs of our Breastside Reminder™ System promote the healthiest feeding opportunities by reminding you which breast you fed from last. The knit fabrics are extra soft and machine washable. The pillow material is also water-resistant to keep all the little accidents from leaking into places they don’t belong. The included nursing cover creates a quiet environment for your baby to focus on feeding without distractions when you’re at home or away. It also includes storage pockets for nursing pads. As your little one grows, the pillow can be also used for lounging, tummy time and sitting support. Dimension (in) 17" x 24.5" x 6.5"
Nursing pillow – Clean before use with a damp cloth and mild soap. Air dry. Do NOT immerse in water.Slip cover – Machine wash with cold water, gentle cycle. No bleach. Air Dry.Nursing cover – Machine wash cold, gentle cycle. Do not bleach. Dry flat. Do not iron. Ingenuity baby gear is designed with parenthood in mind. We understand those everyday parenting challenges, and how thoughtful products and features can make a big difference. Among the "aha" features: ergonomic designs, machine-washable fabrics, smart device connection, battery-saving innovation, and much more. Rated 5 out of 5 by Birdee from Fantastic pillow Great for nursing, this pillow has been a huge help in positioning my baby. I can comfortably lay her on it, and it saves my arms from getting tired. I plan on using it as she gets older to help her learn to sit up. This would make a great baby shower gift for a new mom! Rated 5 out of 5 by pri9949 from so firm yet comfortable I was always skeptical about trying out a nursing pillow. I am glad I did. it is really a good size and great quality which I can use for months for my baby. I can also think of alternate uses like my husband likes to use it as a reading pillow too as its so firm and big. I love the color and print and also like its easy to clean from sudden spills before it gets absorbed . The matching nursing cover is beautiful and so handy when we are in public areas or in the car. The material is soft and machine washable which is nice. Definitely something to invest in or give as a gift. Rated 5 out of 5 by Babysteph from Better than my old nursing pillow! I love the sweet print on the fabric. The pillow fits comfortably around my waist, better than my previous popular nursing pillow. My baby nurses well on it - supportive but soft at the same time. There are tabs to indicate which side you last started feeding on. My new mom brains appreciates little features like that! Rated 2 out of 5 by AMOmomOF3 from Breaks down inside, pretty quickly I have noticed the inside is breaking down and making the pillow less firm. It's starting to lose it's shape. It is comfortable, but the comfort is slowly declining with the lack of firmness. The material inside feels like it's 'shifting'. I'm not sure I would buy another one since this one hasn't lasted very long. We still use it for now, though. Rated 5 out of 5 by Nateforlife from Quality pillow and attractive cover This nursing pillow is by far the nicest one I’ve ever used. The shape is unique and works better than other brands of nursing pillows. It’s comfortable for both mom and baby and the cute cover is easy to remove and wash as needed. Rated 5 out of 5 by Rh32693 from Plenti+ nursing pillow is amazing!!! I have the plenti+ nursing pillow and nursing cover in Mayberry blooms pattern and I am in love! 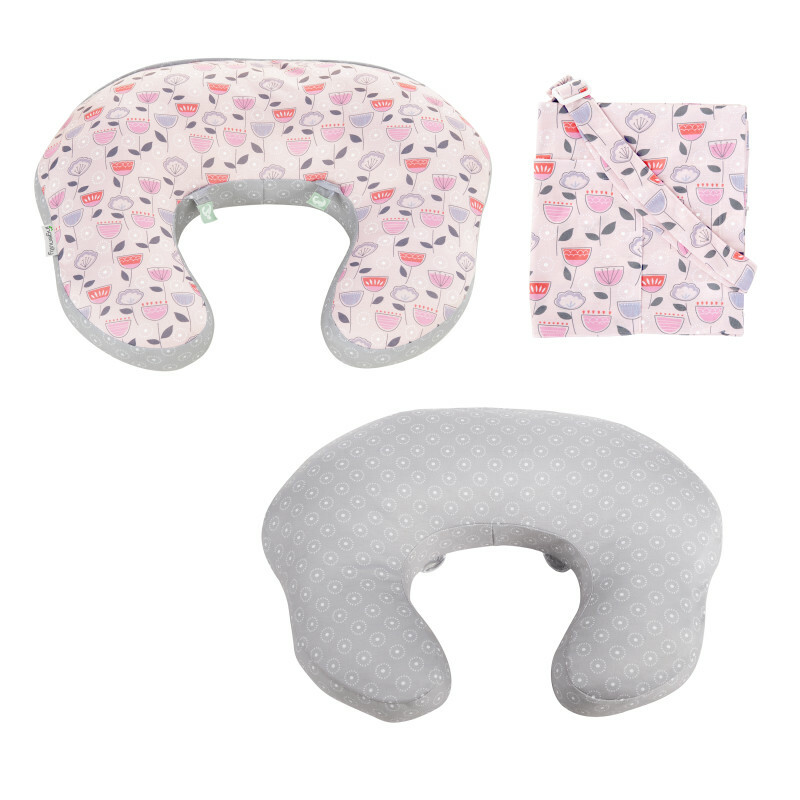 My daughter nurses so much better since I started using this pillow and the nursing cover is so easy to use especially when your on the go and it folds nice and tiny to fit in the diaper bag without taking up space. In my opinion this nursing pillow is better then other brands because it is nice a firm unlike other pillows. Rated 5 out of 5 by MarkT from Nursing pillow I really like this nursing pillow. The pattern is super cute and the cover is very useful when nursing in public. This is the only pillow I've seen that comes with a cover, total bonus in my book! Rated 5 out of 5 by Matt U from Soft, supportive pillow This is the perfect nursing pillow. Its soft yet supportive to assist while nursing, and the attachable cover is a bonus. While not nursing, it makes a great support to prop your kiddo so they can sit independently. We're all in this 2gether! Join our mailing list and get 15% off your first purchase! We’re all in this 2gether.